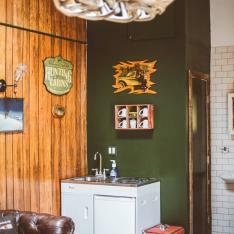 Saddle up, swarthy adventure seekers and dust off your boots! 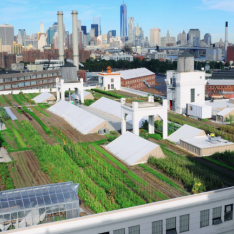 When you arrive at this diamond in the wilds of Williamsburg, you will discover a veritable love letter to the old West as told by the most ruggedly posh of urban cowboys. 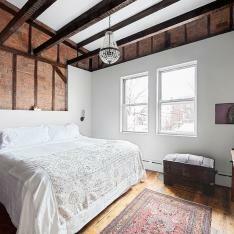 By day, owner Lyon Porter, is the Director of Sales for a Manhattan-based real estate company, and by night a self-confessed innkeeper “cowboy.” Porter bought this property a little over a year ago with the intention of renovating and turning it into a series of apartments. Yet, something happened on a surf trip to Nicaragua. It changed him in a way that only travel can and in lieu of the big paycheck, he followed his east coast heart on the dusty trail west, while keeping his spurs firmly planted in the Big Apple. He speaks lovingly of the Williamsburg of yore, yes much like the Old West when trains didn’t run on schedule, shootouts were common and ahem, ladies of the night set up shop on every corner. 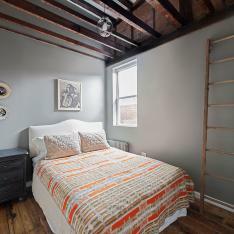 While there are plenty of developments in progress nowadays as well as extremely lovely and posh boutique hotels setting up shop, there is nothing quite like living the Cowboy Way at Urban Cowboy, a Brooklyn Bed & Breakfast. HOW WILL MY GUESTS GET HERE? Out-of-towners can fly into either La Guardia or JFK and take a bus or subway, local city dwellers can take the L-train. Calling all cowgirls! 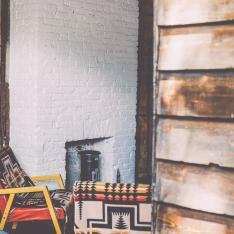 Think John Denver’s “Home on the Range” but with Jay-Z’s “New York State of Mind” and you have a place where the buffalo roam while enjoying slow-drip perfectly roasted organic Ethiopian blend coffee delivered each morning. 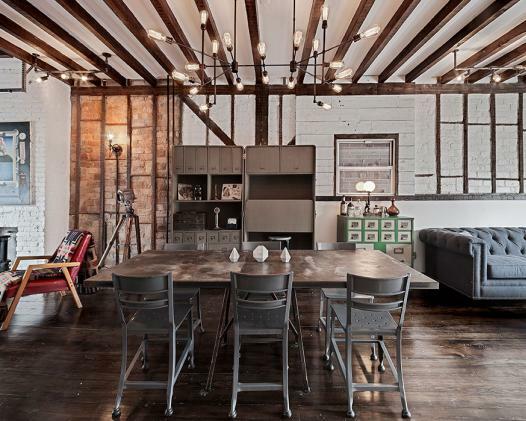 Take a posh Williamsburg townhouse, decorate with travel treasures from the globe, build the coolest clubhouse of all time in the backyard and open it up to nomadic world wanderers. In it’s very basic sense, the Cowboy Way is alive and well. The wayfaring, roaming, fly-by-night cowboy who wishes to rest his weary mind will be right at home here. 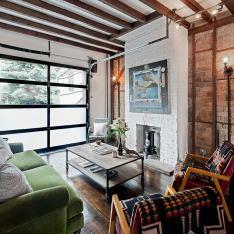 Stop at Urban Cowboy for a weekend or a week. 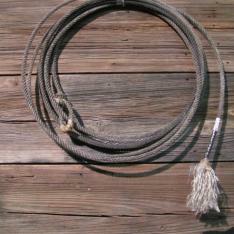 Throw a party, kick up your boots, and enjoy before saddling up that horsey and riding off into the sunset. This is the perfect meeting place for like-minded creatives, romantic dreamers and culinary originators to ring in a rip-roarin’ rootin’-tootin hullabaloo of a hoedown. Bottom line: we’d brave saddle sores to use this perfectly appointed honky-tonk as the venue for our next shindig – we’re envisioning group getaway, corporate retreat, thinktank, creative workshop, wedding reception or dinner party and we’d save a place for Mr. Porter at the table. The crimson door of the Cowboy beckons saucily from the street a veritable “come-hither” look (if walls could talk?) 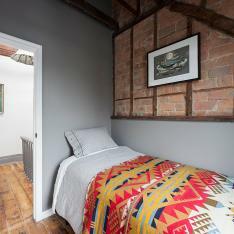 and garage doors open to reveal the hint of stunning exposed brick and beamed ceiling and communal “dream” kitchen with yes, a pot-bellied stove… Four bedrooms with names like “The Dream Catcher” “The Peace Pipe” and of course “The Lion “Master” Den” are all tastefully and simply appointed. 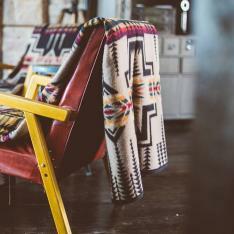 White, dreamy sheets, high ceilings, Pendleton blankets and treasures found all along the trail of Mr. Porter’s life combine to ensure you feel as though you’re staying a friend’s home. Let’s get down to brass tacks. 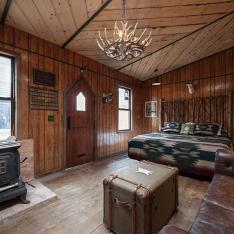 You can rent the “full cowboy” experience including the four bedrooms within the house proper as well as the Kanoono Cabin, nestled in the back garden of the property boasting a king size bed, claw-foot tub and pot-bellied stove for a cool $2k/night. 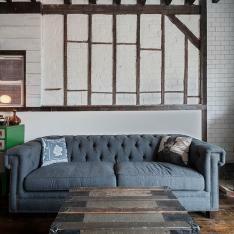 Each stay comes with The daily farmhouse-style breakfast spread - ranging from almond croissants and pumpkin jam to organic oatmeal to biscuits and gravy. But it’s the Sunday night dinners, which feature live music and rotating culinary themes (clam bakes; barbecues), that have become a favorite aspect of the Cowboy – jump in feet first or throw one of your own! 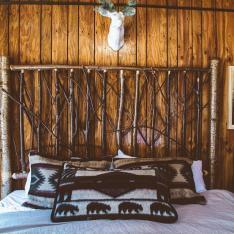 As Lyon Porter says “The Cowboy lifestyle can be nomadic, it can be hard on the road and when one comes home from a long journey, they need a place to rest their bones. 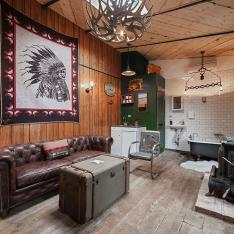 A place comfortable and warm; a bed that comes with breakfast and a hot tub.” We couldn’t agree more. Hopefully the road of life will bring you and your crew to the Cowboy for a brief respite from the dusty trails to dine within the walls of this urban oasis, harkening back to a simpler time. 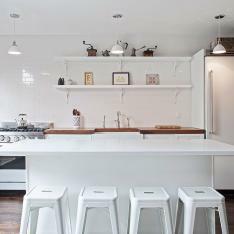 The expansive modern kitchen truly is a “dream” for any type of event – either whip up your own fanciful creations or bring in the chuck wagon – it’s perfectly suited for either. 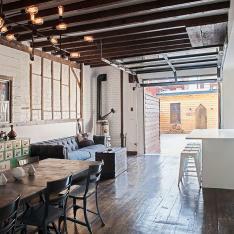 The Cowboy is luxury with an Industrial Williamsburg/Adirondack/Cowboy Sensibility. Pillow Talk. The 4 bedrooms in the freestanding townhouse are composed of a cabin in the back yard with a hot tub and an open parlor floor that boasts operable garage doors on both ends, pot belly stoves, exposed joists and brick, wide plank rough hewn white pine floors…..and a lot more. Urban Cowboy exudes thoughtful charm and impossible cool. 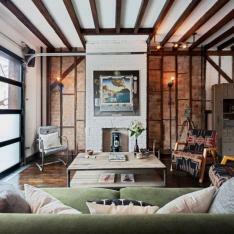 The setting is so rich in texture and layers of design, the best approach here is a simple one. Let the interiors sing while opening the floor-to-ceiling garage doors to let the outside in while keeping your details subtle but with an artisan’s eye. 1. There’s never a second chance to make a first impression, so get it right the first time! Choose soft hand-lettered invitations like these pale pink ones via Oh So Beautiful Paper. 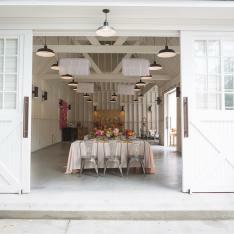 In lieu of the run-of-the-mill information, how about a sweet poem or song lyric to set the tone of your event. Or if you’re throwing a dinner party – how about a toast to get the party started? (We’re partial to those around these parts). 2. 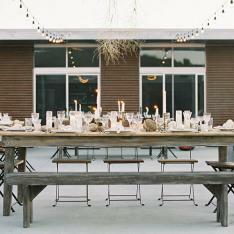 We’re loving succulents as a sweet, hip addition to any table with a nod to the prevalent Old West cowboy theme. 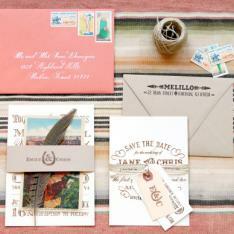 This one from JL Designs is a perfect example of subtle succulent details, with a few wild west touches. 3. The wild west touches we were gabbing about earlier – we love placing these lassos on the back of each chair with a branded leather tag in lieu of placecards. Innkeeper Jersey Banks is your in-house concierge, should any of your group want to venture out into the Williamsburg wilds she’ll be happy to coordinate that band wagon for you to jump on. In the morning, breakfast is delivered from Urban Cowboys local partners. Decide between a variety of pastries, quiches, organic fruit, yogurt & granola, and of course the Brooklyn roasts that are hand ground in-house. 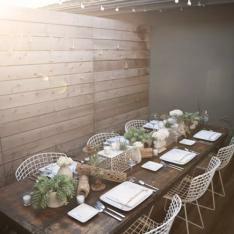 Additionally if you are just here for a group getaway and not throwing a party of your own, you and your crew can mingle with the native Brooklynites during the various dinner parties and events hosted by the owner! 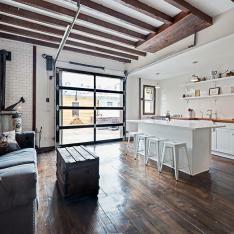 Williamsburg townhouse meets industrial Adirondack. 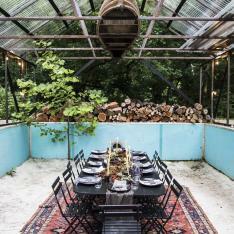 Five rooms + a cabin in the backyard provide the perfect intimate setting for a group getaway, creative workshop, corporate retreat, small wedding ceremony, cocktail or dinner party. In the words of Mr Rogers -Won't you be my neighbor? Stay here and you will get to know your neighbors from across the globe. A welcome and most revered pastime is watching a movie in McCarren park where L Magazine is sponsoring free movies have been taking place at the basketball / tennis / whatever you'd like to name them courts on the Southwest corner of the park. Bring pillows and a blanket for a picnic. 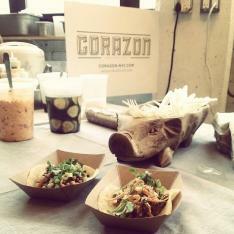 Local food sellers and Brooklyn Brewery offer up drink and food. Movies shown are usually campy or nostalgic. It's a fantastic summer evening. 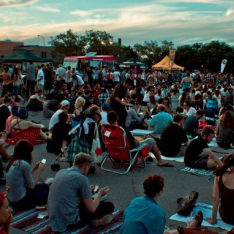 Enjoy an epicurean extravaganza at Brooklyns Flea Food Market, Smorgasburg. Smorgasburg happens in two locations every weekend: Saturdays at East River State Park—Kent Ave. and N. 7 St.—on the Williamsburg waterfront; and Sundays at Brooklyn Bridge Park’s Pier 5.Both locations are open from 11am - 6pm with a total of 75-100 vendors. The markets are open rain or shine. Peruse amazing local food vendors and craft brews will shopping for a few flea finds. Not to be missed! 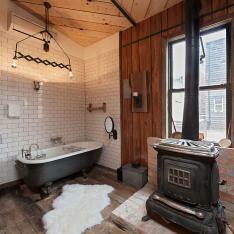 Birthday Bucket List: "Living Tiny" at a Stylish Small House Hotel in the Woods!! !